The first step to good neighborly relations is to introduce yourself early on. This helps build a sense of community so that your neighbor feels comfortable knocking on your door if there is a problem. If you have failed to introduce yourself up to this point, make sure you do so because you could be giving off an unfriendly vibe and they could be reacting to that. This does not mean banging their door down at the first sign of something you don’t like. What it does mean is asking nicely if they are doing something you don’t like. Again, if you have already introduced yourself, this process is a lot easier because you can stop by and have a quick chat without seeming like the grumpy neighbor that just complains. You may be surprised to find that the offense was unintentional and they had no idea they were bothering you until you said something! Ta-Da! Yes, there may be some expectations of you when it comes to being a good neighbor as well. If there is a mess that needs cleaning up or some other issue that you can reasonably assist with to keep things in good standing, try to do your part. Being passive aggressive and allowing the problem to get worse and worse as a “punishment” for their bad neighborliness is only going to make the whole situation harder on both of you. If the problem you’re dealing with poses a safety risk or has legal consequences, or if your neighbor is not responding to your friendly requests, you may have reason to go above their heads. Document any dates that you have discussed the problem with the neighbor, and talk to your property management team, or even local authorities if there is a safety problem. 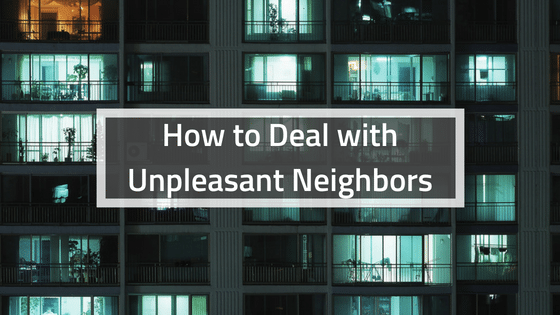 These simple tips can help you engage with your neighbors and sort issues out before they turn into a turf war. As you search for apartments for rent in Destin, you can use these quick tips to meet the neighbors and get comfortable in your new space! Don’t underestimate the power of simply introducing yourself in the first place as a means of building a strong relationship with your neighbors going forward. Check out Sugarloaf for more information today! © 2019 Sugarloaf Luxury Apartments. Website Design by Captevrix.